As Syria prepares to liberate the southwestern portion of the country still held by Western-backed terrorists, the United States is repeatedly threatening “firm and appropriate” responses against the Syrian government, proving yet again that the U.S. is nothing more than al-Qaeda’s air force. However, while most of the world has come to the conclusion that the biggest threat to peace and stability is actually America, not Syria or Iran, the public of the United States and Western Europe continue to somnambulently absorb the propaganda spewed by their governments and corporate media outlets. This then provides the world with an ever-present danger since the West is able to propagandize its own populations so successfully regarding false flag chemical weapons, tales of Assad “killing his own people,” and other “crimes against humanity” perpetrated by the Syrian government against civilians in order to whip up support for another more intense military adventure. This narrative has been used repeatedly not just on the Western populace but also the member states of the United Nations, firmly ensconced in the deeply corrupt and agenda driven institutions who are themselves part of the Atlanticist UN. Indeed, the “chemical attack” narrative has been used repeatedly in both administrations to justify war crimes, crimes against humanity, and imperialist military assaults against the secular and sovereign government of Syria. This is why fresh warnings coming from Russia and Syria over the possibility of yet another staged chemical attack in Syria should be taken seriously and watched carefully. 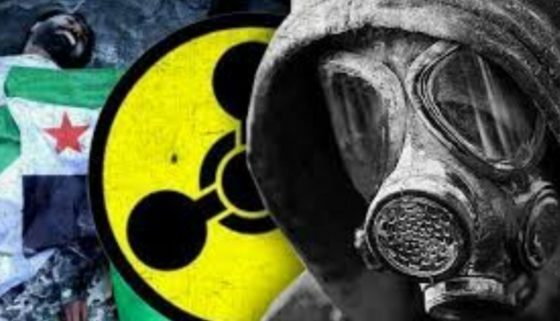 According to a report by Arabi Souri of Syria News, the Syrian National Committee on Implementing the Chemical Weapons Convention is warning that the United States is preparing a new false flag chemical attack to use as a justification for an attack on Syria. ‘Families were brought from areas under SDF control to the illegal base set by the USA in the al-Jafra Oil field northeast of Syria where they have been trained for about 5 days on how to act like the fake chemical attack in Douma’ the committee citing reliable information in its possession. The SNCCWC told SANA (Syrian Arab News Agency) that ISIS will act in coordination with the SDF and U.S. forces in the base in order to stir up provocations with the SAA near the al-Jafra oil field. Specifically, a false flag chemical attack will be staged in a village near the oil field. It will be the 3rd time the current regime of Donald Trump to use a false flag chemical attack to justify, in its opinion, an attack on the Syrian state and its armed forces. The first such bombing was carried out by the Trump regime alone against the SAA’s al-Shuayrat Air Base in April 2017, claiming to be in retaliation for a false flag chemical attack carried out in the town of Khan Sheikhoun in Idlib province northwest of Syria, and the second one with its accessories in NATO crimes the UK and France against research centers and multiple posts of the SAA in the country on April 14th, last month, and this time claiming to be in retaliation of the false flag chemical attack carried out in Douma, Damascus Countryside. Both false flags were exposed, but that doesn’t stop the pariahs ruling the USA, France, and Britain from continuing their crimes. The warning comes as Russia highlighted “suspicious movements” of “militant groups” in the area of al-Tanf, near the US military base there. Lavrov pointed out that, while he saw no indications that the U.S. was preparing to withdraw from Tanf, he would welcome their doing so. Syrian pro-government forces who attempt to enter the US security perimeter near Al-Tanf are subject to airstrikes by coalition warplanes. On August 8, 2016 the BBC published photographs and reported on yet another illegal incursion into Syria by Western NATO forces and yet another violation of Syrian national sovereignty by the U.K. This time, the photographs showed British Special Forces operating on the ground inside Syria in al-Tanf, near the Syrian-Iraq border, an area that is also near the Jordanian border. The pictures themselves date back to June of this 2016 and appear to have been taken shortly after a battle at al-Tanf between the New Syrian Army and ISIS, both Western-backed terrorist organizations. The British soldiers were photographed allegedly setting up a perimeter in order to guard the NSA base from further incursion by ISIS. According to eyewitnesses, they were there in a defensive role. But they are carrying an arsenal of equipment including sniper rifles, heavy machine guns and anti-tank missiles. If IS attacked again they would have been able to put up a considerable fight. A New Syrian Army’s spokesman refused to comment on the pictures of the special forces, but acknowledged their help. The New Syrian Army is designated as a “moderate” terrorist organization and fights under the umbrella of the Free Syrian Army, another Western-backed “moderate” operation that has committed innumerable horrific acts of violence and atrocities all throughout the Syrian crisis. It should be noted that the terrorist group that beheaded a young child on camera weeks ago, Nour al-Din al-Zenghi, was also considered a “moderate” organization and one that had been “vetted” by the U.S. State Department as worthy of receiving TOW missiles. According to the source, the preparations began on April 23. The civilians are being shipped to a territory near Jafra oil field to participate in a staged filming of an attack scene. Although based on one source, it should be noted that France is now making statements similar to those it made in the run-up to the staged Douma chemical weapons attack where it announced that if Bashar al-Assad used chemical weapons, France would take action. “The goal of the strike against Syria was to prevent Bashar Assad from repeating such attack. If this happens, we can consider the possibility of repeated strikes,” French Defense Minister Florence Parley said. With the reputation and history of the United States and France in Syria taken in concert with the warnings coming from both the Russians and the Syrians, the possibility of a false flag chemical attack being staged is very real.